Ragin' Cajun Creations: "Top Ten Most Interesting Faces of the Year"
The International Society of Caricature Artists (ISCA) of which (as of this year) I am a member, has started a tradition this year which I am sure will become a new media staple. 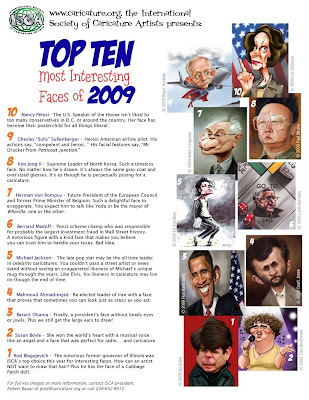 They have released their list of the "Top Ten Most Interesting Faces of the Year". I’m not sure who all was involved in the decision making process, but “interesting”, as in most suited for caricature, is an understatement. I think I have sketched at least half the people on this list at one time or another, and it’s always fun to exaggerate their features. These days it seems that every media outlet in the world publishes some sort of “The Year‘s Most Whatever.” Yet, this list is quite unique in the sense that most everyone can agree on the humor in it, without the ever present “who deserves what” arguments that inevitably follow every other list of accomplished people. ISCA president Robert Bauer, and other members of the organization’s board, called on a few fellow members to caricature those on the list. No doubt, most people will recognize the work of such giants in the field of caricature as Tom Richmond, Jason Seiler, Paul Moyse, Court Jones, Glenn Ferguson, and several others. So, sit back and enjoy the ISCA’s list of the “Top Ten Most Interesting Faces of the Year”. In fact, whether you’re an artist or not, grab a pencil and paper and have a go at them yourself. I promise you will have fun drawing these faces!